To the right is a yellow wall with several routes, then a smaller cave. There are single anchor bolts with hangers, so to abseil go south a few metres to the anchors for Release The Wombats. Just right of the arete. Start using an undercut hold and swing your feet to the right over the Muehlenbeckia creeper (so as not to trample on it) to the obvious foot-holds. Pleasant climbing follows all the way to the top. Starting on a small ledge in the back of the cave, followed by a traverse under the roof makes it a couple of grades harder. Four bolts, anchors as for Disco Logic. 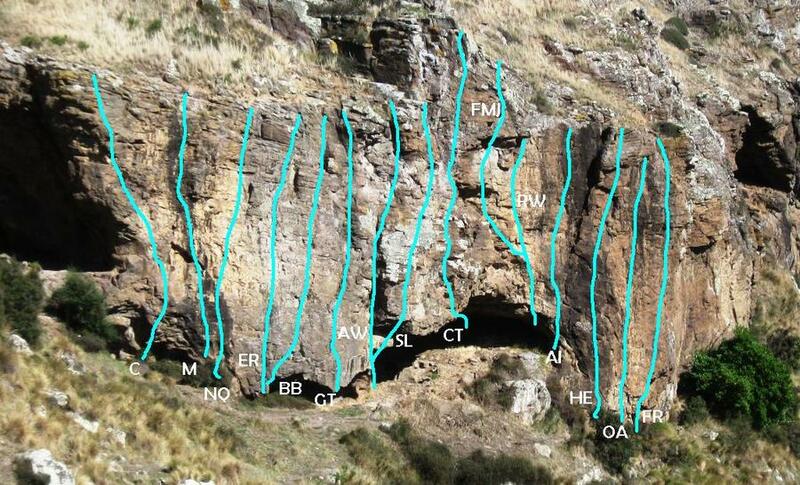 Start four metres right of the cave at the black streak, which is followed over the bulge and up the wall to the top. One bolt anchor. Start just right of Mercy at the foot of steep black section of rock. Climb the black wall, then the yellow wall above trending slightly right. Poor protection in the middle of the route. In the centre of the yellow wall. Up to the ledge, then climb the wall past two bolts, trending right-ward past the ledges. Natural protection at the top and bolt anchors. Up the wall using faint crack, though it's better than you would expect from the ground. Hard start on the left of the small cave and then the climbing is straight-forward. Two metres left of the corner. Start at the lowest point of the slab. Boulder on to the downward-pointing tooth, then follow breaks with easier climbing past two bolts slightly rightward to the top, using natural protection which is a little tricky to place. Bolt anchor to the right. Left-facing corner at the edge of a small cave. Technical start past two bolts (watch the block) to a ledge with natural protection, then up to a steep exit past another bolt and through a notch. Loose at the top, don't grow wings. Anchor bolt. At the end of the wall swing rightward past two bolts to gain the wall above the cave. Up easy but loose rock to a difficult clip at the last bolt on a steepening exit. Bolted by Simon Courtois, but handed over to Tony after Simon hurt his knee. The next four routes start at the next smaller cave and climb over it to gain the wall above. Climb gymnastically out of the small cave and at the third bolt move left, then continue straight up with awkward moves through the overhang. Same start but continue straight up the wall. Tricky clip at the fourth bolt and a little run-out to the top. Anchor rings to right shared with AI. Pull through the roof a metre right and climb the wall, trending slightly right following four bolts. Anchor as for the previous route. Crack at the right end of the cave. Avoids the action by climbing the left-facing corner with natural protection, to finish at the chains for Happy Ending. “out of Africa” revisited. Climb the cracks past 2 BR and go direct to the third bolt. Continue straight up the shallow weakness to a pillar just left and above the fifth bolt. Using the pillar move up higher (6th bolt) finish leftish over the final bulge to the belay of ‘Happy Ending’. Climb up and trend left a little until you can reach rightward from big sloping holds and clip the first bolt. Then up the wall to a small pillar above the top bolt, where a wire can be placed to help with a committing move right to finish into the scoop. Direct line up a steepening orange wall just left of the arête, with five bolts. Committing moves to gain the bulge, followed by an easy finish.